With the gradual release of 2011 census data, I thought it would be worth looking at some transport related themes. I’ll start with residential density (for my look at 2006 density, see an earlier post). This post looks at 2011 density, and how density has changed over the years. The big issue with residential density is how you measure it. In showing it graphically, I prefer to use the smallest available geographic areas, as that can remove tracts of land that are not used for residential purposes (such as parks, creeks, wide road reservations etc). At the time of posting, 2011 census population data was only available at “Statistical Area Level 1” (SA1). In 2013, population figures for the smallest ABS geographic unit – mesh blocks – will be available for a fine grain look at density. However, land use descriptions for mesh blocks were available at the time of posting. I have used the indicated land use of each block to mask out land where you would not expect people to live – including land that is classed as parkland, industrial, water, or transport. 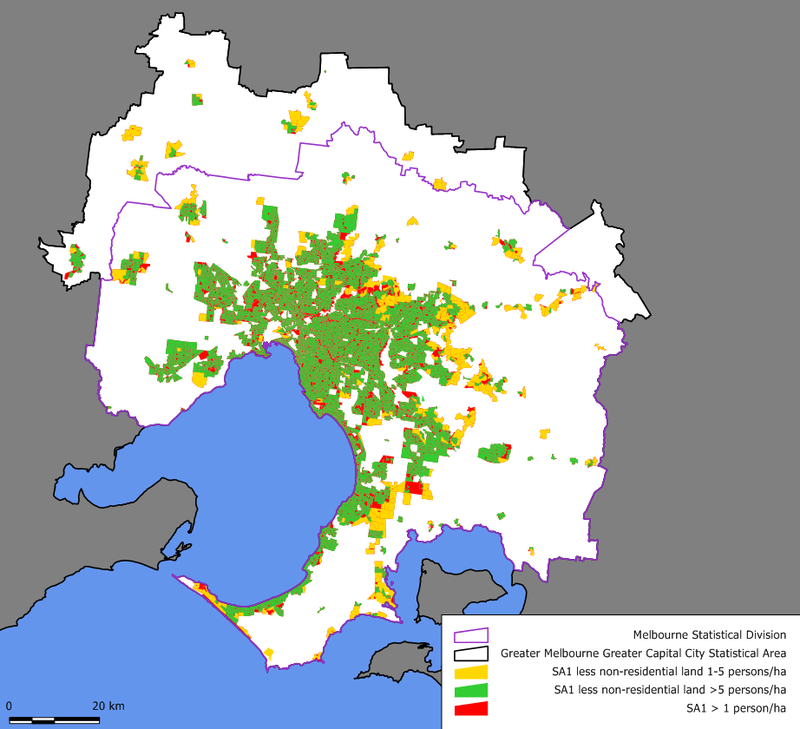 So the map below shows the residential density of Melbourne for SA1s, after stripping out non-residential land. The densities will be higher than if you simply looked at straight SA1 density, but I think they will be a better representation (although not as good as what can be drawn when 2011 mesh block population figures are available). You’ll want to click on the map to zoom in. The map doesn’t show areas with less than 5 persons per hectare (otherwise there would be a sea of red in rural areas). Many of the red areas on the urban fringe are larger SA1s which will be fully residential in future but were only partially populated at the time of the census. However some are just low density semi-rural areas. Note that the older middle and outer eastern suburbs are much less dense than the newer growth areas to Melbourne’s north and north-west. How has density changed between 2006 and 2011? I think the most interesting comparison will be between 2006 and 2011 mesh block density maps. We will be able to see in detail where densification has occurred, and it will be particularly interesting to look at activity centres. The smallest unchanged geography level with time series data available is at Statistical Area Level 2 (SA2) – which generally contain one large suburb or a couple of smaller suburbs. Data is available for all years 1991 to 2011 (estimates for June 30, based on census results). The following map shows the change in estimated density from 2006 to 2011 (using full SA2 land parcels, including any non-residential land). This could equally be considered density of population growth. Unfortunately urban growth in pockets of larger SA2s are less likely to show up as the impacts are washed across the entire SA2, but it gives some idea. the outer growth areas, particularly to the west, north and south-east. How has density changed between 1991 and 2011? Here is an animation showing how Melbourne’s density has changed between 1991 and 2011. You’ll need to click on this to see the animation and more detail. The CBD and Southbank area going from very sparse to very dense population. The significant densification of Port Melbourne. The significant densification of the inner northern suburbs, particularly in the late 2000s. Some large SA2s in the growth areas don’t show up as becoming more dense as they are very large parcels of land with urbanisation only occurring in a small section. This is especially the case for Wyndham and Whittlesea. 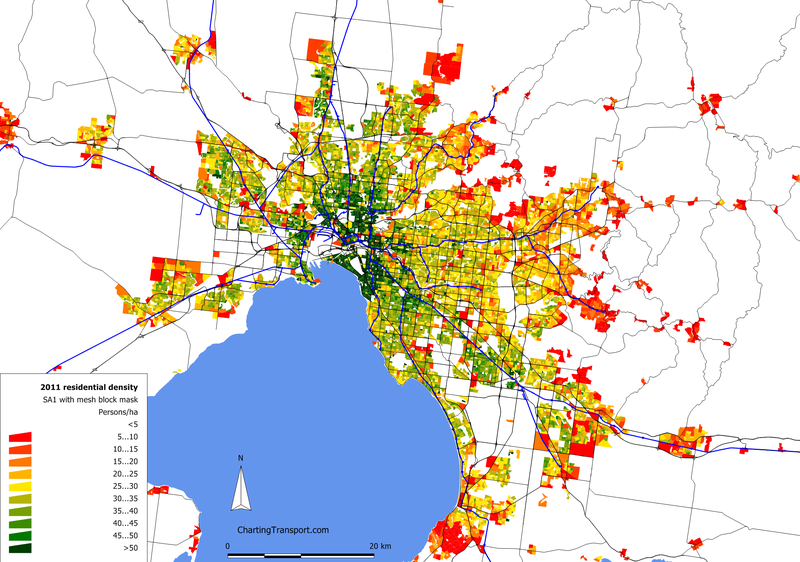 So what was Melbourne’s “urban” density in 2011? That all depends how you define “urban” Melbourne! The table below shows some calculations based on different criteria for including land. The more restrictive criteria will give an answer that is more of a “residential” than “urban” density. The different geographies are confusing, so I have produced a map below to try to help. When more census data is available I will aim to update this list (eg to include density of the Melbourne urban locality). *This area is actually larger than the row above, because more SA1s meet the criteria. Confused? It’s because I’ve cut out the non-residential land from each SA1, which increases the average density of what remains meaning more SA1s meet the criteria. The residential land area of the extra SA1s was slightly more than the non-residential land that was cut out. On the map below there are some yellow and green areas that do not have red “underneath”. The red areas you see on the map below are non-residential land in SA1s. I’ve calculated the average density of “Greater Melbourne” in the first row for completeness, but this is a bit meaningless as the vast majority of land in “Greater Melbourne” is non-urban land (the white area in the map below). This entry was posted on Friday, September 21st, 2012 at 10:43 pm and is filed under Melbourne, Urban density, Urban Planning. You can follow any responses to this entry through the RSS 2.0 feed. You can leave a response, or trackback from your own site. According to the diagrams I don’t ride to work? Wonder how I get here – and yes I said I did on the sensis..